Sjögren syndrome, which is rare in pediatric patients, is a slowly progressive inflammatory disorder that involves the exocrine glands. Mikulicz and others recognized the findings of keratoconjunctivitis and xerostomia as an entity in the late 1800s. In 1933, Sjögren recognized the association of this symptom complex with polyarthritis. Lower facial appearance of a 14-year-old adolescent girl with Sjögren syndrome. She exhibits both parotid and submandibular gland enlargement and chapped lips. Lower facial appearance of a 14-year-old adolescent girl with Sjogren syndrome. She exhibits both parotid and submandibular gland enlargement and chapped lips. Intraoral view of a 14-year-old adolescent girl with Sjögren syndrome. 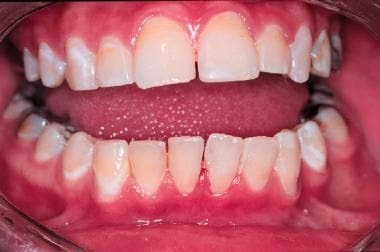 Hyposalivation results in erythema of the mucosa, gingivitis, decalcification or white spot lesions of the teeth at the cervical margin, and dental caries with extensive restorations of the posterior teeth. Intraoral view of a 14-year-old adolescent girl with Sjogren syndrome. Hyposalivation results in erythema of the mucosa, gingivitis, decalcification or white spot lesions of the teeth at the cervical margin, and dental caries with extensive restorations of the posterior teeth. 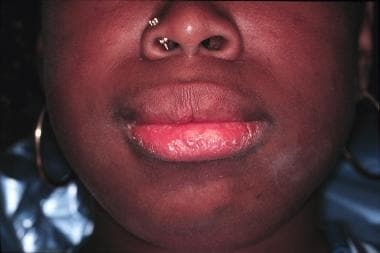 Erythema of the labial mucosa with enlargement of the minor salivary glands and superficial mucoceles. The dorsal surface of the tongue demonstrates generalized atrophy of the filiform papillae, mild fissuring, and median rhomboid glossitis. A 14-year-old adolescent girl with Sjögren syndrome with painful unilateral swelling of the knee and hyperpigmentation of the overlying skin. A 14-year-old adolescent girl with Sjogren syndrome with painful unilateral swelling of the knee and hyperpigmentation of the overlying skin. As Sjögren syndrome is a chronic disease, participation in a local or national support group may be beneficial. The Sjögren's Syndrome Foundation is an example of an organization that helps individuals cope with this disease. Additional resources can be found at the Lupus Foundation of America and the Arthritis Foundation. For patient education information, see the Arthritis Center, as well as Sjögren’s Syndrome. The predominant immune cells are activated memory CD4+ T cells that express alpha/beta T-cell receptors, suggesting a central role in the pathogenesis of this disorder. Activated B cells are also found in the lesions, which may be responsible for the production of the autoantibodies to autoantigens Ro (SS-A) and La (SS-B). Anti-Ro (SS-A) is found in 40-45% of adult patients with Sjögren syndrome, and anti-La (SS-B) is found in 50% of these patients. The presence of anti-Ro (SS-A) and anti-La (SS-B) is associated with earlier onset, longer duration, and more extensive extraglandular manifestations of primary Sjögren syndrome. Positivity in these antibodies appears to be higher in children, according to a systematic review of the literature (rheumatoid factor [RF], 66%; antinuclear antibody [ANA], 78%; SS-A, 74%; SS-B, 65%). [9, 10, 11] Because these autoantibodies are also observed in other autoimmune disorders, including SLE, further diagnostic tools must be used for a more definitive diagnosis. Researchers have found a high prevalence of anti-Muscarinic-3 acetylcholine receptor autoantibodies in Japanese children with primary Sjögren syndrome. These antibodies are postulated to be involved in defective glandular function and as anti-SSA and anti-SSBA, could be potentially useful as a diagnostic marker for primary Sjögren in children and adolescent. In situ evidence suggests that proinflammatory cytokines, interleukin (IL)-1, IL-6, and tumor necrosis factor (TNF)–alpha are produced in the salivary glands. These cytokines are found in the infiltrating lymphocytes and the epithelial cells. This suggests that the infiltrating lymphocytes (ie, predominantly CD4+ T cells) play a role in the perpetuation of an aberrant immune response. Specific IL-10 haplotypes are associated with early onset and vasculitic features of disease. IL-21 levels was noted to correlate positively with serum IgG and IL-21 expression is increased as more lymphocytes infiltrated in LSG among patients with primary SS. [14, 15] Additional cytokine and chemokine gene polymorphisms continue to be focus of several ongoing studies. An active area of research involves genetic polymorphisms of cytokine genes, including IL10 and TNFA. Associations with these polymorphisms might implicate inappropriate regulation of the immune response in Sjögren syndrome. Altered apoptotic mechanisms have also been implicated in the pathogenesis of Sjögren syndrome–related exocrinopathies. Exocrine gland tissue damage and chronic inflammation lead to fibrotic changes and impaired glandular function. The pathophysiology of extraglandular manifestations is thought to be due to similar immune mechanisms. Epstein-Barr virus (EBV) replicates in the salivary glands during primary infection and remains latent in these organs. EBV deoxyribonucleic acid (DNA) is recovered from the salivary glands and saliva of patients with Sjögren syndrome. Its etiopathologic role cannot be proven. Human immunodeficiency virus (HIV), human T-cell leukemia-lymphoma virus type 1 (HTLV-1), and cytomegalovirus (CMV) are also being studied as possible inciting agents of the lymphoproliferation observed in the end organs. Primary disease is rare in childhood, as only 145 cases of primary disease have been described in the international pediatric literature. Five percent of adult patients report onset of symptoms before age 12 years. Clinical manifestations and classification schema differ in pediatric patients; therefore, this disorder may be underreported. Features of Sjögren syndrome are well described in pediatric patients who have other autoimmune disorders and oftentimes it is defined as an overlapping syndrome. Epidemiologic studies from different ethnic groups show prevalence rates similar to those in the United States. In 2 studies, the mean age of diagnosis for primary juvenile Sjögren syndrome was 10 years. [9, 10] Although Sjögren syndrome has been recognized in patients of all ages, it primarily affects women in the fourth and fifth decades of life. Patients with primary Sjögren syndrome usually have a good prognosis unless systemic and/or severe extraglandular manifestations develop. The prognosis of secondary Sjögren syndrome depends on the primary autoimmune disorder. Although most adult patients have a mild and benign course, they often experience painful eye irritation, severe dental caries, and dyspareunia. Pediatric patients often do not have early sicca syndrome symptomatology but often have recurrent parotitis, which commonly is diagnosed as recurrent parotitis of childhood, another uncommon pediatric disorder with a bimodal age incidence of 2-5 and 10 years of age. Because of the insidious nature of these symptoms, patients often do not seek medical attention until more severe symptoms appear years later. Lymphoproliferative disorders increase 40-fold in adult Sjögren syndrome. Although significant lymphoproliferation usually remains confined to the salivary and lacrimal glands, extraglandular lymphoproliferation (eg, lymphadenopathy, hepatosplenomegaly) sometimes resembles lymphoma (eg, pseudolymphoma) and may herald frank malignancies, including non-Hodgkin lymphoma, Waldenström macroglobulinemia, and B-cell lymphoma. Associations with lymphoproliferative diseases are not well described in pediatric populations. Fox RI. Sjogren's syndrome. Lancet. 2005 Jul 23-29. 366(9482):321-31. [Medline]. Jonsson R, Haga H-J, Gordon TP. Sjogren's syndrome. Koopman's Textbook of Arthritis and Allied Health Conditions. 14th ed. Philadelphia, PA: Lippincott, Williams, & Wilkins; 2001. 1736-59. Manoussakis MN, Georgopoulou C, Zintzaras E, Spyropoulou M, Stavropoulou A, Skopouli FN, et al. Sjögren's syndrome associated with systemic lupus erythematosus: clinical and laboratory profiles and comparison with primary Sjögren's syndrome. Arthritis Rheum. 2004 Mar. 50(3):882-91. [Medline]. Petty RE, Laxer RM, Lindsley CB, Wedderrburn LR. Sjogren's syndrome. Textbook of Pediatric Rheumatology. 2016. 7th ed: 427-435. Ramos-Casals M, Tzioufas AG, Font J. Primary Sjögren's syndrome: new clinical and therapeutic concepts. Ann Rheum Dis. 2005 Mar. 64(3):347-54. [Medline]. [Full Text]. Igarashi T, Itoh Y, Shimizu A, Igarashi T, Yoshizaki K, Fukunaga Y. A case of juvenile Sjögren's syndrome with interstitial nephritis. J Nippon Med Sch. 2012. 79(4):286-90. [Medline]. Ramos-Casals M, Font J. Primary Sjogren's syndrome: current and emergent aetiopathogenic concepts. Rheumatology (Oxford). 2005 Nov. 44(11):1354-67. [Medline]. Kassan SS, Moutsopoulos HM. Clinical manifestations and early diagnosis of Sjögren syndrome. Arch Intern Med. 2004 Jun 28. 164(12):1275-84. [Medline]. Civilibal M, Canpolat N, Yurt A, et al. A child with primary Sjogren syndrome and a review of the literature. Clin Pediatr (Phila). 2007 Oct. 46(8):738-42. [Medline]. Cimaz R, Casadei A, Rose C, et al. Primary Sjogren syndrome in the paediatric age: a multicentre survey. Eur J Paediatr. 2003. 162 (10):661-5. [Medline]. Anaya JM, Ogawa N, Talal N. Sjogren's syndrome in childhood. J Rheumatol. 1995 Jun. 22(6):1152-8. [Medline]. Nakamura Y, Wakamatsu E, Matsumoto I, et al. High prevalence of autoantibodies to muscarinic-3 acetylcholine receptor in patients with juvenile-onset Sjogren syndrome. Ann Rheum Dis. 2008 Jan. 67(1):136-7. [Medline]. Arkfeld DG. The potential utility of B cell-directed biologic therapy in autoimmune diseases. Rheumatol Int. 2008 Jan. 28(3):205-15. [Medline]. Kang KY, Kim HO, Kwok SK, Ju JH, Park KS, Sun DI, et al. Impact of interleukin-21 in the pathogenesis of primary Sjögren's syndrome: increased serum levels of interleukin-21 and its expression in the labial salivary glands. Arthritis Res Ther. 2011. 13 (5):R179. [Medline]. Bledsoe, JR, Della-Torre E, Rovati L, Despande V. IgG4‐related disease: review of the histopathologic features, differential diagnosis, and therapeutic approach. APMIS. June 2018. 126:459-476. Reveille JD, Arnett FC. The immunogenetics of Sjogren's syndrome. Rheum Dis Clin North Am. 1992 Aug. 18(3):539-50. [Medline]. Singer NG, Tomanova-Soltys I, Lowe R. Sjogren's syndrome in childhood. Curr Rheumatol Rep. 2008 Apr. 10(2):147-55. [Medline]. DeGuzman M, Fishman MA, Lewis RA, et al. Chronic neurologic disease with visual, gait and bladder problems in a male teenager. J Pediatr. 1998. 132:742-47. [Medline]. Kobayashi I, Furuta H, Tame A, et al. Complications of childhood Sjogren syndrome. Eur J Pediatr. 1996 Oct. 155(10):890-4. [Medline]. Ramos-Casals M, Solans R, Rosas J, Camps MT, Gil A, Del Pino-Montes J. Primary Sjogren syndrome in Spain: clinical and immunologic expression in 1010 patients. Medicine (Baltimore). 2008 Jul. 87(4):210-9. [Medline]. Tarvin SE, O'Neil KM. Systemic Lupus Erythematosus, Sjögren Syndrome, and Mixed Connective Tissue Disease in Children and Adolescents. Pediatr Clin North Am. 2018 Aug. 65 (4):711-737. [Medline]. Houghton K, Malleson P, Cabral D, Petty R, Tucker L. Primary Sjogren's syndrome in children and adolescents: are proposed diagnostic criteria applicable?. J Rheumatol. 2005 Nov. 32(11):2225-32. [Medline]. Pessler F, Emery H, Dai L, Wu YM, Monash B, Cron RQ, et al. The spectrum of renal tubular acidosis in paediatric Sjögren syndrome. Rheumatology (Oxford). 2006 Jan. 45(1):85-91. [Medline]. Baszis K, Toib D, Cooper M, French A, White A. Recurrent parotitis as a presentation of primary pediatric Sjögren syndrome. Pediatrics. 2012 Jan. 129(1):e179-82. [Medline]. Vitali C, Bombardieri S, Jonsson R, et al. Classification criteria for Sjögren's syndrome: a revised version of the European criteria proposed by the American-European Consensus Group. Ann Rheum Dis. 2002 Jun. 61(6):554-8. [Medline]. [Full Text]. Bartunkova J, Sediva A, Vencovsky J, Tesar V. Primary Sjogren's syndrome in children and adolescents: proposal for diagnostic criteria. Clin Exp Rheumatol. 1999 May-Jun. 17(3):381-6. [Medline]. Giacobbe A, Grasso R, Foti G, Interdonato ML, Mancuso A. Sjögren's syndrome associated with antiphospholipid syndrome and fetal myocardial echogenicity: case report. J Prenat Med. 2013 Apr. 7(2):29-31. [Medline]. [Full Text]. Rigante D, Inzitari R, Carone M, et al. Correspondence between clinical improvement and proteomic changes of the salivary peptide complex in a child with primary Sjogren syndrome. Rheumatol Int. 2008 Jun. 28(8):801-6. [Medline]. Stiller M, Golder W, Döring E, Kliem K. Diagnostic value of sialography with both the conventional and digital subtraction techniques in children with primary and secondary Sjogren's syndrome. Oral Surg Oral Med Oral Pathol Oral Radiol Endod. 1999 Nov. 88(5):620-7. [Medline]. Fox PC, Brennan M, Pillemer S, Radfar L, Yamano S, Baum BJ. Sjogren's syndrome: a model for dental care in the 21st century. J Am Dent Assoc. 1998 Jun. 129(6):719-28. [Medline]. Cornec D, Jousse-Joulin S, Marhadour T, Pers JO, Boisramé-Gastrin S, Renaudineau Y, et al. Salivary gland ultrasonography improves the diagnostic performance of the 2012 American College of Rheumatology classification criteria for Sjögren's syndrome. Rheumatology (Oxford). 2014 Sep. 53 (9):1604-7. [Medline]. Douglas D. Ultrasound Improves Sjogren's Syndrome Classification. Reuters Health Information. Available at http://www.medscape.com/viewarticle/824530. May 03, 2014; Accessed: December 11, 2015.
de Souza TR, Silva IH, Carvalho AT, Gomes VB, Duarte AP, Leão JC, et al. Juvenile Sjögren syndrome: distinctive age, unique findings. Pediatr Dent. 2012 Sep-Oct. 34(5):427-30. [Medline]. van der Reijden WA, Vissink A, Veerman EC, Amerongen AV. Treatment of oral dryness related complaints (xerostomia) in Sjogren's syndrome. Ann Rheum Dis. 1999 Aug. 58(8):465-74. [Medline]. Suzuki K, Matsumoto M, Nakashima M, Takada K, Nakanishi T, Okada M, et al. Effect of cevimeline on salivary components in patients with Sjögren syndrome. Pharmacology. 2005 May. 74(2):100-5. [Medline]. The dorsal tongue demonstrates hyperplastic candidiasis with focal erosions and a brown hairy tongue. Ulcerated fissures are observed on the corners of the mouth that represent angular cheilitis. 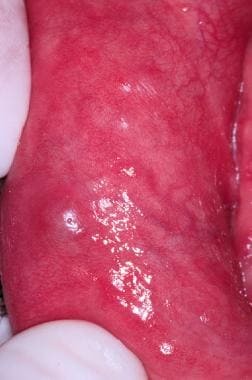 Biopsy of the minor salivary glands of the lower lip may be useful in the diagnosis of Sjögren syndrome. A 1.5- to 2-cm incision of normal-appearing mucosa allows for the harvesting of 5 or more salivary gland lobules. Low-power photomicrograph of a minor salivary gland lobule showing multiple lymphocytic foci that are replacing the acinar structures (hematoxylin-eosin, 40 X). Intermediate-power photomicrograph demonstrating a chronic inflammatory aggregate of more than 50 lymphocytes and plasma cells with a periductal pattern. The inflammatory focus is adjacent to normal appearing acini (hematoxylin-eosin, 200 X). High-power photomicrograph of the chronic inflammatory aggregate consists of lymphocytes and plasma cells around a ductal structure (hematoxylin-eosin, 400 X). Disclosure: Serve(d) as a director, officer, partner, employee, advisor, consultant or trustee for: American Academy of Pediatric Dentistry Board of Trustees; Commissioner of Dental Accreditation; Director, American Board of Ora and Maxillofacial Pathology; Associate Chief of Dentistry at Nationwide Children's Hospital<br/>Serve(d) as a speaker or a member of a speakers bureau for: American Academy of Pediatric Dentistry Speakers Bureau<br/>Travel Grant from GC America; American Academy of Pediatric Dentistry for Continuing Education Presenter for: Multiple speaking engagements for dental meetings.